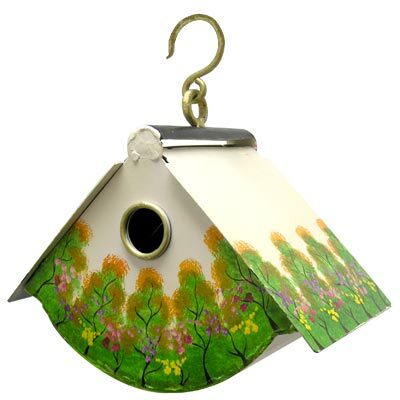 Celebrate the colors and shapes of the forest while providing a roosting spot for small songbirds using the Achla Cozy Den Bird House. This charming shelter adds a wonderful look to your bird garden, with its pitched roof, rounded shape, and sylvan detailing. The beige background color creates a neutral palette, while hand painted tree shapes with green leaves, orange accents, and purple and pink flowers surround the piece. A 1.125" diameter entry hole rests on the front of this iron home, allowing small birds to enter the unit, and a metal ring around this opening captures attention. The slightly curved base is roomy enough for an avian family, and a drainage hole here ensures the nest remains dry. The two roof panels slope downward for a wonderful shape, and can lift upward for quick nest checks or cleaning. This shape also ensures the home stays nicely ventilated, and a rounded bar at the top of the item completes the look. A robust, brass hanger attaches here, for placing the home on a hook in moments. The iron body lasts for many seasons, and the bold colors lend a vivid hint to your backyard. Offer birds their own treehouse with this Cozy Den Bird House. Note: As each item is hand painted, individual finishes may vary.